This collection of poignant and uplifting essays is the perfect book to enjoy over your morning coffee. The stories will warm your heart, raise your spirits and compel you to examine your own life. 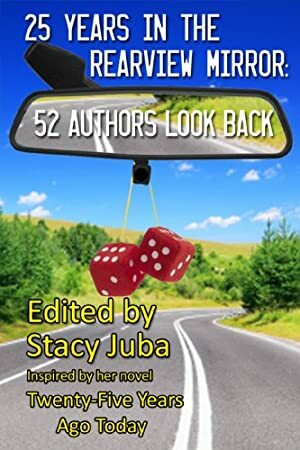 As a tie-in to her mystery book Twenty-Five Years Ago Today, novelist and award-winning journalist Stacy Juba invited her author colleagues to answer the question "What were you doing 25 years ago?" Read about school days, quirky jobs, romance, raising a family, hard times, the writing journey, and find out what makes your favorite characters tick. This 30,000-word book will help readers to discover new authors for their to-read list, and inspire them to reflect upon the small defining moments that have shaped their own lives. Publishing credits of the contributing writers include New York Times bestselling, USA Today bestselling, and Amazon bestselling. They also include recipients of the Romantic Times Lifetime Achievement Award, Minotaur Books/Mystery Writers of America First Crime Novel Award, Mississippi Author Award, Benjamin Franklin Award and Eppie Award, as well as nominees of the Pushcart Prize, Agatha and Shamus Awards, to name a few of the many honors. School Days: Literary Friends by Stacy Juba, The Red Man by Maria Savva, Rocking in the '80s by Susan Helene Gottfried, Seniors are Wimps by Matthew Dicks, Prom Night by A.W. Hartoin, Friend in Need by Alina Adams, A Life-Changing Decision by CJ Lyons, Oldest Campus Editor Looks Back by Sharon Love Cook. The Ups and Downs of Family Life: The Elephant in the Living Room by Mary Anna Evans, Baby Steps by Tracy Krauss, Finding the Right Balance by Barbara Ross, Climbing the Mountain of Single Parenthood by J. R. Lindermuth, The More Things Change, the More They Stay the Same by Donna Fletcher Crow, A Busy Mom's Dream by Deanna Jewel, Family Fun at the Dinner Table by Maryann Miller. Hard Times: Finding the Right Direction by Michele Drier, The Scent of Lives Changed Forever by Beth Kanell, Surviving the Killer Tsunami by Cherish D'Angelo (Cheryl Kaye Tardif), Christa's Legacy by Jaleta Clegg, Weathering the Storm by Red Tash. Characters Have Pasts, Too: Diana's Promise by Stacy Juba, The Sandbox by Darcia Helle, An Empty Nest by Suzanne Young, Misfortune's Daughter by Mary Deal,The White Widow by Norma Huss, The Policeman by Vicki Delany, Miranda's History by Leslie Wheeler, Meeting Sam Fullerton by Ellis Vidler, The Gas Chamber by Douglas Corleone, Storm Shadow Eyes by Caitlyn Hunter. Log In to track Cara Lopez Lee on eReaderIQ. to be notified each time the price drops on any book by Cara Lopez Lee. to stop tracking Cara Lopez Lee. Log In to track Cheryl Kaye Tardif on eReaderIQ. to be notified each time the price drops on any book by Cheryl Kaye Tardif. to stop tracking Cheryl Kaye Tardif. Log In to track CJ Lyons on eReaderIQ. to be notified each time the price drops on any book by CJ Lyons. to stop tracking CJ Lyons. Log In to track Darcia Helle on eReaderIQ. to be notified each time the price drops on any book by Darcia Helle. to stop tracking Darcia Helle. Log In to track Donna Fletcher Crow on eReaderIQ. to be notified each time the price drops on any book by Donna Fletcher Crow. to stop tracking Donna Fletcher Crow. Log In to track Gwen Mayo on eReaderIQ. to be notified each time the price drops on any book by Gwen Mayo. to stop tracking Gwen Mayo. Log In to track Laura DiSilverio on eReaderIQ. to be notified each time the price drops on any book by Laura DiSilverio. to stop tracking Laura DiSilverio. Log In to track Mary Anna Evans on eReaderIQ. to be notified each time the price drops on any book by Mary Anna Evans. to stop tracking Mary Anna Evans. Log In to track Vicki Delany on eReaderIQ. to be notified each time the price drops on any book by Vicki Delany. to stop tracking Vicki Delany. Log In to track Elaine Raco Chase on eReaderIQ. to be notified each time the price drops on any book by Elaine Raco Chase. to stop tracking Elaine Raco Chase. We started tracking this book on October 12, 2012. The price of this book has changed one time in the past 2,381 days. The current price of this book is FREE last checked 6 hours ago. We last verified the price of this book about 6 hours ago. At that time, the price was $0.00. This price is subject to change. The price displayed on the Amazon.com website at the time of purchase is the price you will pay for this book. Please confirm the price before making any purchases.